As the tri-annual Outback Air Race readies for the 2015 event, we profile long-time AvPlan EFB user Warren Millar about his flying life and involvement in the race. Warren is a Kiwi, whose interest in aviation can be traced back to his five year-old self launching off the chook shed roof with nothing more than a fascination for flight and a large black umbrella for support. The inevitable crash landing did nothing to dampen his enthusiasm. “My first flight in an aeroplane was at the age of 10. In the small town of Masterton, New Zealand where I grew up, I attended an air pageant with my family at Hood Aerodrome,” says Warren. Warren’s 18-year career with Baldwin as a farm and mining machinery serviceman and then salesman, took him to many parts of the outback and afforded him the opportunity to passenger on some great bush flying with a colleague. The journeys were to places like Albury, Condobolin, Goondiwindi, Emerald and many airports up the east coast to Tully, in northern Qld servicing the locomotives at the sugar mills. When life slowed down and domestic responsibilities receded, Warren immersed himself more in his love of aviation. 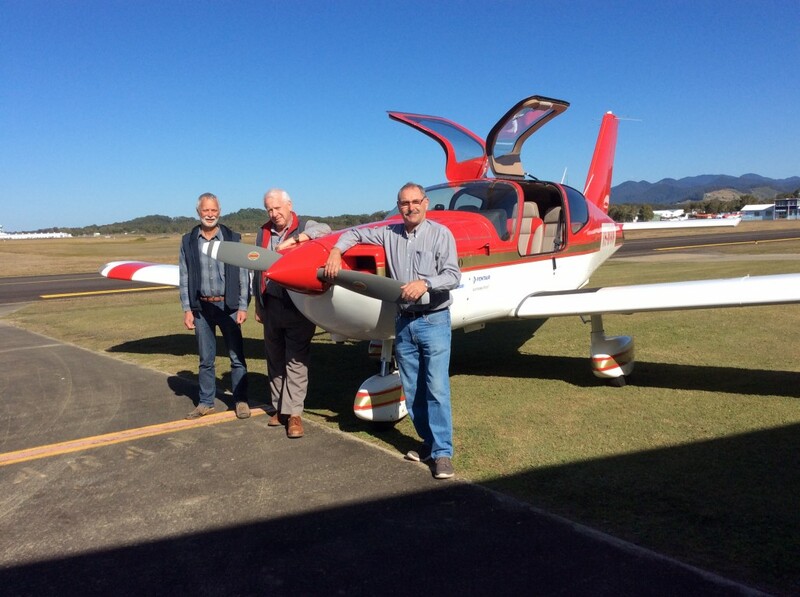 “In 2001 I purchased a quarter share in a Socata TB10 with members at the Coffs Harbour Aero Club and after a couple of member changes we ended with a syndicate of three consisting of Geff Leaver, John Harris and myself. We’ve spent many hundreds of hours flying together to countless inland destinations, such as Kalgoorlie, Lake Eyre, Coober Pedy, Ayres Rock, Alice Springs and including a circumnavigation of the Australian mainland coastline. Of the syndicate, Warren admits he is the passionate one—he just loves aviation and does the flying with John. A medical issue has now relegated Geff to the role of flight attendant. The Triple Whisky team became involved with the Outback Air Race earlier this year when it was mentioned in an online forum. Warren emailed Geff and John and they signed up the following day. “It’s the sort of flying we like and the RFDS is a great cause to fundraise for. We’ve seen them all around the country and seen what they do. We always hear them in the air. Though I’ve never seen an emergency case, I know people who have used them,” says Warren. As the team prepares for the race, Warren is emphatic in his praise for AvPlan EFB. When flying and away from the comfort of the home office, flight planning was always a hassle each morning. Dragging along the earlier type laptop was also a pain and getting weather and putting in a plan at a motel could be a time consuming job. When Bevan came along with AvPlan EFB it was like a breath of fresh air. We had a portable program that could get us the weather, knock out a flight plan and submit it to NAIPS from anywhere we had wifi or 3G connection to the iPad. As well as the convenience of flight planning, AvPlan EFB is also a great aid in the cockpit for situational awareness. At the touch of a button we can update weather, check the status of restricted areas, get METARS and even see by colour code which is the active runway. “I love keeping up with technology and I have used AvPlan EFB from its inception. Initially, it was a raw product but the framework was moulded around the flight plan, which is its strength. On a recent commercial flight from Broome to Sydney, Warren switched on his iPad. “I switched AvPlan EFB on airplane mode and fired her up so I could track the flight. Sitting in my window seat, it worked flawlessly all the way. It was marvelous to have AvPlan EFB on the WAC and looking down from 35,000 feet all the features such as salt pans and rock formations just came alive. I love the view from up top, looking down on the rocks and formations. My favorite part is the red centre; there’s just something about that landscape.